Recognized throughout the Hawaiian islands and beyond for our delicious, all butter bite-sized “nibbles,” School Kine Cookies helps individuals and groups meet their financial goals with specially customized fundraisers that are profitable, easy and fun. School Kine Cookies offers a proven lineup of irresistible fundraising products, made with only the highest quality ingredients, and with no added preservatives or trans-fat, including our new and healthier WELLNESS COOKIES that meet State of Hawaii and Federal Child Nutrition Guidelines, GOUVEA´S PORTUGUESE SAUSAGE and, of course, our ORIGINAL RECIPE SCHOOL KINE COOKIES. 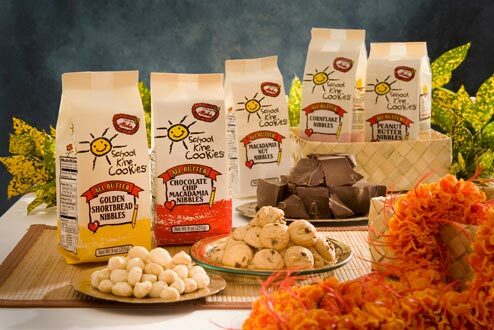 With our easy-to-sell, winning fundraising products and more than a quarter century of proven fundraising experience, School Kine Cookies has the perfect solution for all your fundraising needs. Parents/Students - Click here to register and sell cookies for your fundraiser. Fundraiser Supporters - Click here to purchase cookies to benefit a fundraiser.